Some of New Jersey’s many claims-to-fame include being number one in the US for population density, number one for number of diners, and birthplace to musicians such as Bruce Springsteen and Jon Bon Jovi. This is also a state made up of many diverse regions. North Jersey contains the state’s urban and industrial centers and is widely considered part of the New York City metropolitan area. South Jersey is home to the Pine Barrens and is generally more rural than suburban. And of course, the towns making up the Jersey Shore constitute a region all their own. Of the 34 scored cities in New Jersey, 25 are in at least the 25th percentile of cities scored nationwide. Nine cities are in at least the 10th percentile, and four cities are in the 5th percentile. It’s worth noting that New Jersey law enforcement agencies changed their crime reporting practices in 2015, so 2014-2015 trend data is not used in this state’s ranking. 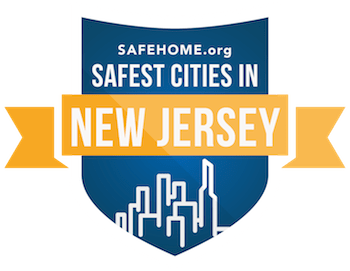 The top 10 safest cities in New Jersey are clustered around the New York City metropolitan area and the northern Jersey Shore area. This has more to do with the fact that these are the larger population centers in the state, not that South Jersey is less safe. Parsippany-Troy Hills Township, in Morris County, earns the distinction of the safest city in New Jersey by our rankings. Parsippany has frequently been in the top 20 of Money Magazine’s “Best Places to Live in the United States” list, so it’s not just safe but an all-around great place to live. Farther south and closer to the shore is Middletown Township, the second safest city, which experienced only eight robberies per 100,000 residents in 2015. The seventh city on the list, Bayonne, has the smallest population-to-officer ratio of any city in the dataset, at 227 citizens per officer.